We use a non-invasive, proprietary technique that allows our technicians to maneuver from inside the body panels of the vehicle and apply pressure to the required area to push the dent back to its original condition. Unlike conventional methods which involve the need to fill in the dent, sand and re-finish/paint, we can have your vehicle back to you within hours - not days! Our unique process reshapes and molds the metal back to its original form. It is a cost-effective way to restore your vehicle’s appearance and value by removing dents, dings, and hail damage. For hail damage, please visit us for a free estimate. Your minor dents can be repaired during your next service appointment. We also welcome walk-ins and appointments where time permits. We use the finest materials and workmanship guaranteeing you the best possible result. Your dent repair is guaranteed for as long as you own your vehicle. If you live here in Alberta then you're all but too familiar with the hail storms we get each year. It can be frustrating to constantly be worrying about your car and where you park it when the clouds have "that look". If you find yourself having been caught in one of these storms and your European car is damaged by hail... give us a shout because we'll undo it for you! 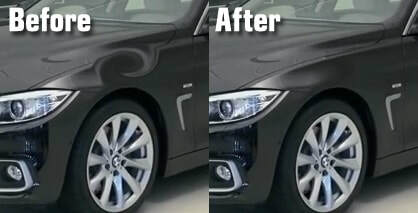 Don't stress - our proven method of removing dents is the fastest and most affordable way to fix minor body damage! We don’t fill car hail damage with costly filler and paint; we get dents out and preserve your vehicle’s original finish so that your vehicle will look like it did before the storm! At Euroworks you will always receive an honest and accurate estimate prior to repairs so that you’ll know the anticipated cost. We’ll do everything we can to complete our work in a timely manner so that you can get back on the road. Our highly skilled technicians allow for quick repairs and incredible customer service is guaranteed.